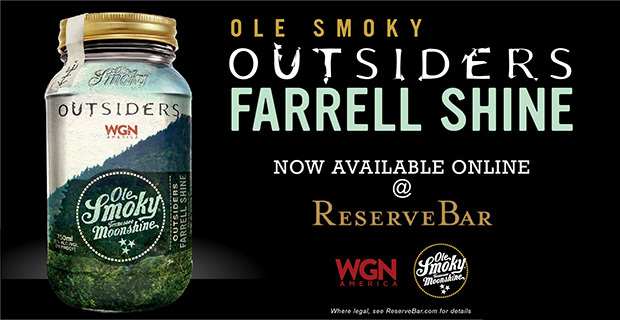 Gatlinburg, TN (February 22, 2017) Ole Smoky Distillery and WGN America’s Outsiders’ co-branded product, Outsiders Farrell Shine, is now available for delivery through ReserveBar.com. Until recently, the limited edition flavor was only sold in select stores and in a handful of states. With the overwhelming number of requests, Ole Smoky decided to increase its availability by featuring the product on ReserveBar. “Our relationship with Ole Smoky has been great, and their flavors do very well on the platform,” says Lindsay Held, President of ReserveBar. “We are excited to add Outsiders Farrell Shine to their portfolio. This limited edition and co-branded jar is sure to be a big hit with our customers. ReserveBar.com is the leading online marketplace for spirits, wine and other beverages. The platform allows for easy, convenient ordering of Ole Smoky Moonshine in states where delivery is permitted. Ole Smoky has worked with the company for over a year, delivering their core moonshine flavors to ReserveBar’s customers. This is the first time Ole Smoky is expanding on the site. Outsiders Farrell Shine launched on January 24th when Ole Smoky Distillery and WGN America announced their partnership to support the highly anticipated second season of the hit TV series, “Outsiders,” which is produced by Sony Pictures Television. Inspired by the fictional “Farrell Wine” featured in the show, it contains similar ingredients. This 70-proof ginger and ginseng-flavored moonshine is housed in a unique, commemorative mason jar. ReserveBar is the premier marketplace for the spirits industry, showcasing premium, luxury, lifestyle and aspirational brands in a content-rich, “on-brand” manner, and facilitating a high-end e-commerce consumer experience for the purchase of premium brands and personalized gifts. WGN America, the flagship entertainment network of Tribune Media Company (NYSE: TRCO) is nationally distributed in nearly 80 million homes via cable, satellite and telco, with high-quality entertainment programming including the breakout hit series “Outsiders” and “Underground”. The network also brings its audience a strong slate of popular first-run syndicated series and blockbuster movies. Through Tribune Studios, the creative development arm of Tribune Media, original content is produced for WGN America and Tribune local stations nationwide. Follow the network on Twitter @wgnamerica. For additional information, please visit www.wgnamerica.com. Ole Smoky now retails globally and offers more than twenty creative flavors crafted from authentic family recipes. And while Ole Smoky has long been enjoyed on the porch from the jar or the jug, Ole Smoky now finds itself mixed in handcrafted cocktails of the finest order in establishments across the U.S. including some of the biggest music and sporting events in the country. For more information, please visit www.olesmoky.com and find them on social media @olesmoky.